Mostly bluish-black in color and usually patterned with as many as 50 yellow or orange round spots, arranged in two rows down each side of the spine. Some have even been seen without spotting. They have a lighter underside with small spots. In the larval stage, it does not look like the adult at all, and breathes through gills on the outside of its body. Mature, moist woodlands with access to vernal pools, rivers or streams for breeding. They spend most of the year in underground burrows, but are sometimes found under rocks, rotting logs or in leaf litter. From central and southern Ontario, Nova Scotia, Prince Edward Island, mainland New Brunswick and south through the United States to the Gulf of Mexico. Also found throughout the Great Lakes region. Small invertebrates, such as worms, insects, spiders, slugs and snails. As soon as the snow melts in March or April, this species will begin to mate. The adults follow creeks in their migration to temporary or permanent pools of water that do not contain predatory fish. Adults breed in the same pond year after year, for their whole lives. Females lay their eggs in clusters of up to 200. They coat the eggs with a thick jellylike substance that holds them together and anchors the mass to vegetation in the water. Algae grow on the cluster, turning it green. This is crucial to development because the algae help supply oxygen to the eggs. It takes from 60 to 90 days for the eggs to hatch. Like the tadpole stage of a frog, the larval salamander must remain in the water for another 60 to 90 days to complete its metamorphosis. Young salamanders eat the larvae of such insects as beetles and mosquitoes. 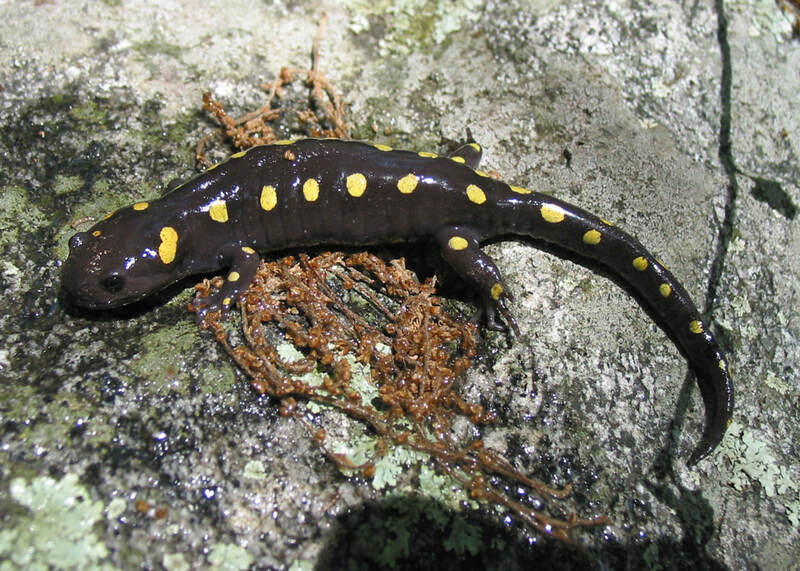 As adults, spotted salamanders produce a toxin in glands on their back and tail. If a predator grabs them, the toxin quickly lets it know the salamander is not a good meal. Not considered endangered, but threats to their populations do exist. Salamanders are very sensitive to pollution and other changes in their environment. They are vulnerable to habitat loss and also put at risk by people who collect them for the pet trade. There are approximately 500 known species of salamanders. This species is a kind of mole salamander, a group of North American amphibians that include the tiger salamander and the axolotl. Salamanders look like lizards, but are not. They start out living in the water, and then move out onto the land. Secretive and expert at hiding, spotted salamanders live in forests throughout much of the eastern United States and Canada. Though they can reach lengths of over seven inches and are brightly patterned, they are not easy to find. During the day they may even use other animals’ burrows as hideouts. If you are lucky, you can spot ours during an education program here at the Zoo.